Not your boring potato salad! 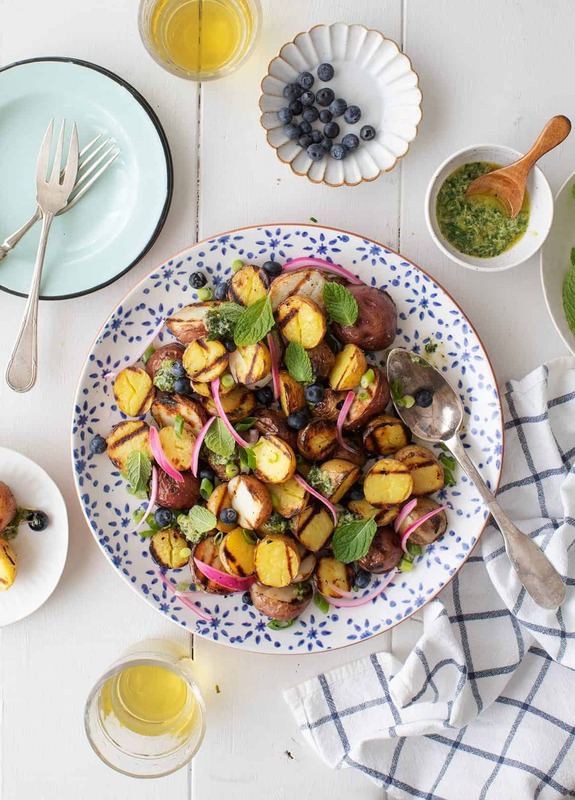 This recipe is SO flavorful from the charred potatoes, grilled scallion dressing and grilled blueberries. Vegan, gluten free. Happy Sunday! 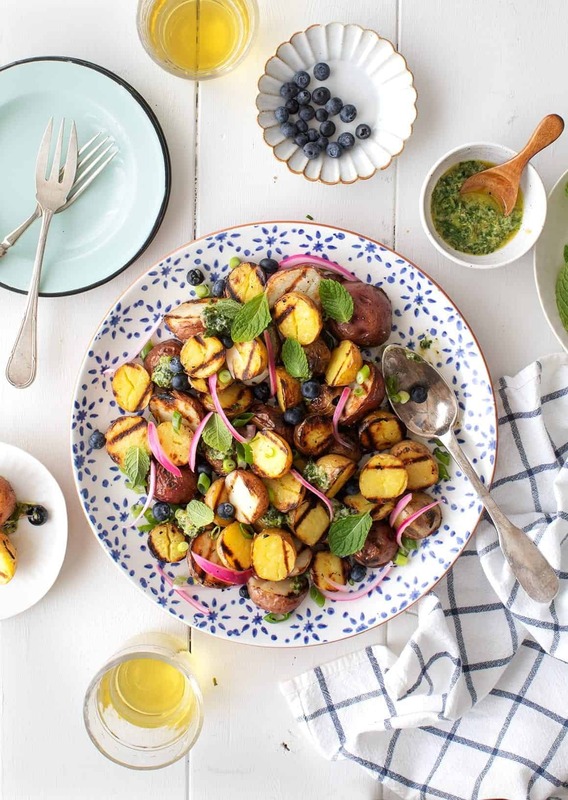 If you need one more recipe idea to make for your weekend celebrations, give this grilled potato salad a try! When I say the words “potato salad,” my mind can only think of the kind that is laden with mayonnaise… which, admittedly, I will eat and enjoy once in a blue moon, but I love this one SO much more. By par-boiling and then grilling the potatoes, you get to taste the wonderful char-ry taste of the actual potato and not just a bunch of mayo. And speaking of not-mayo, this dressing is ridiculously good. Grilled scallions are blended with miso, vinegar, mustard, olive oil, and a touch of hot sauce (but not enough to make it too spicy)… it’s a brilliant combination by one of my favorite chefs, Stephanie Izard, who owns a bunch of restaurants in Chicago, my favorite being The Girl and the Goat. What I love most about Stephanie’s food is that she puts unexpected ingredients together with flavors that really pop. You might think “how are blueberries, miso, and potatoes going to taste together,” and the answer is: of course it’ll taste awesome because Stephanie thought of it. 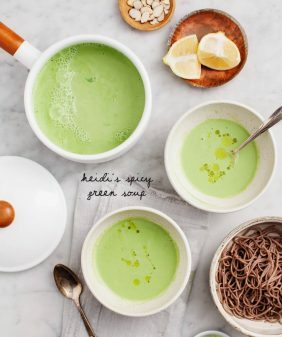 This recipe comes from her new book Gather & Graze. 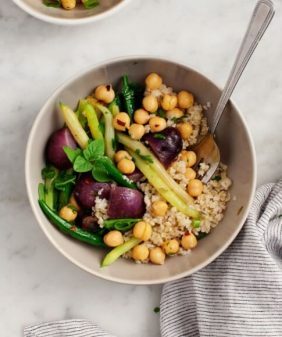 What really draws me to this recipe is the grilling trifecta – the potatoes, scallions, and the blueberries all utilize the grill. This was a hit last weekend when I made it for our entire family. 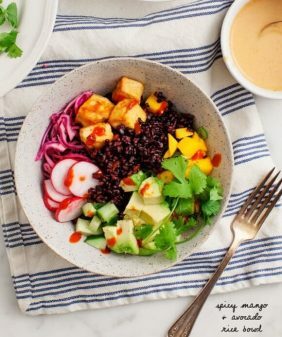 When I made it again for the blog, I added a few things – some pickled onions to the salad and a handful of cilantro to the dressing – to make the salad more colorful. For more awesome summer recipes, check out Gather & Graze. It’s not vegetarian by any stretch but there are some really creative plant-forward ideas that I have bookmarked: Grilled Maitake Mushrooms with Tart Plums, Pickled Watermelon Rind Salad, and Strawberry Gazpacho, just to name a few. 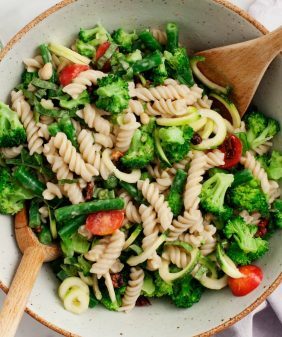 For more last-minute veggie grilling inspo, try these grilled recipes that I posted earlier this week! This recipe is adapted from Gather & Graze by Stephanie Izardand is re-published with permission from the publisher. Boil the potatoes: Fill a medium pot with room temperature water. Add a handful of salt to the water and then the potatoes. Bring the water to a rolling boil and then reduce the heat so that the water simmers. Cook until the potatoes are just fork-tender, about 15 minutes (they’ll finish cooking on the grill). Drain the potatoes, and when cool enough to handle, cut in half lengthwise. Make the dressing: Toss the scallions with ½ tablespoon of the oil and season with a pinch of salt. Grill until just charred, turning once, about 2 minutes. Chop and transfer to a food processor and add the vinegar, miso, mustard, sriracha, and 3 tablespoons water. Pulse until combined. Add the cilantro and the remaining 2 tablespoons oil and pulse again. Toss the potatoes generously with olive oil, salt and pepper. Grill cut side down for 5 to 6 minutes or until char marks form. Flip, and cook 5 minutes more, until the potatoes are tender and well charred. The time will depend on the size of your potatoes. Place the blueberries in a piece of foil that's large enough to contain them on the grill. Toss with a drizzle of olive oil and grill for 2 minutes or until they turn a darker blue color. 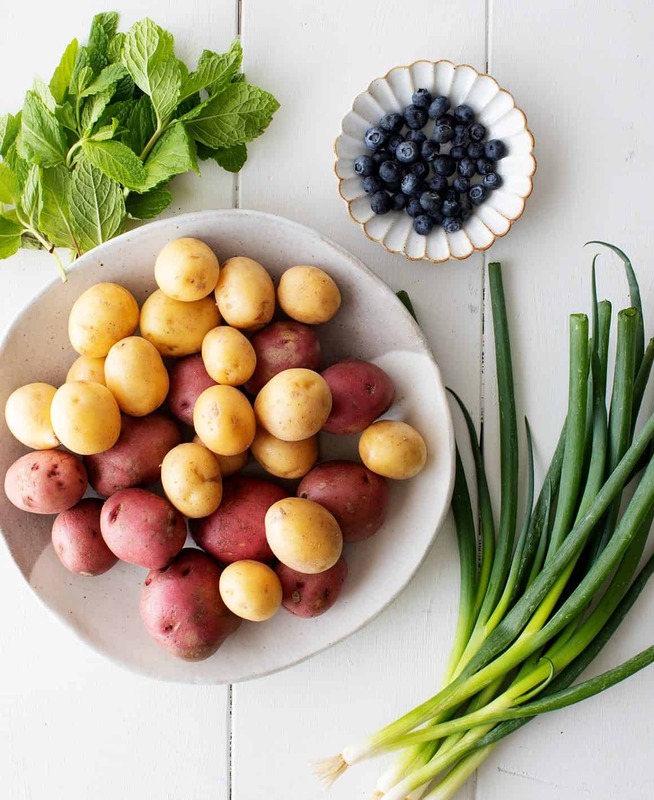 Assemble the salad with the potatoes, generous dollops of the dressing, blueberries, mint, the chopped scallions, and more dollops of the dressing. Top with pickled onions, if using. Serve warm or at room temperature. So intrigued to try a grilled potato salad! Mmmm, I love this grilled spin on the classic BBQ side! It’s looking so delicious and yummy, will definitely try. Can I use something else instead of blueberries? 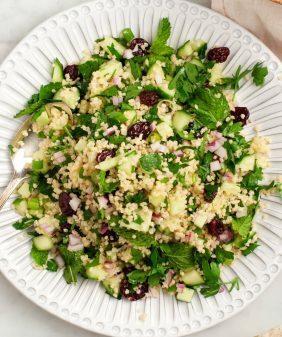 You can skip them if you want – the big flavor is in the scallion dressing, the blueberries are just a fun little pop of flavor. Loved this idea! I did a simplified version (no blueberries or pickled onions) but boiling then grilling the potatoes and that dressing (swapped in apple cider vinegar) were so delicious!! Thank you. I have oregano, dill and tarragon in my fridge is there one of those you would recommend subbing for the cilantro? 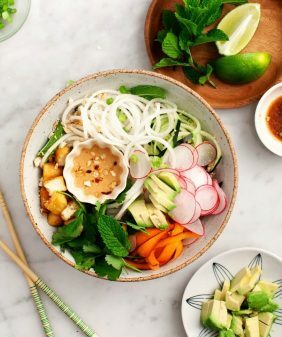 I would just skip the cilantro – it’s still very delicious without it, the color will just be more brown. Hope that helps! Anyway I can leave out the miso? I have everything except that? You can, just season to taste with a little extra salt, since miso is salty. Hope that helps!